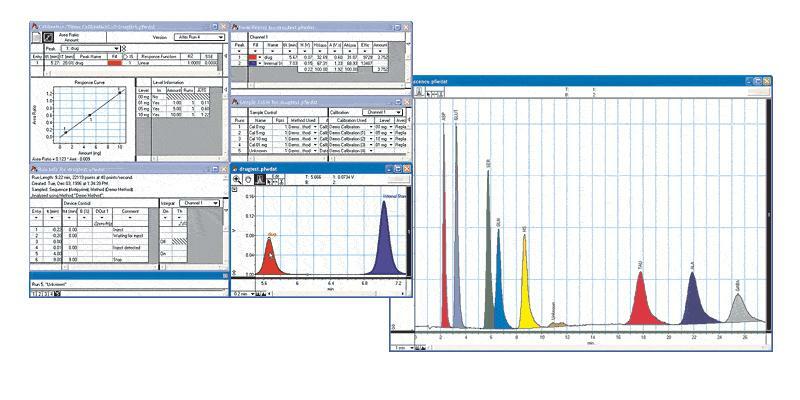 PowerChrom software is used for the collection, display and analysis of chromatographic and similar signals. Runs on Windows 10, XP, Vista and 7 computers. PowerChrom is supplied as part of the PowerChrom system, or separately for use with e-corder recording systems. Signals can be recorded from one or two chromatography detectors. Most detectors that have a "recorder" or "integrator" output are suitable. PowerChrom is the ideal data acquisition system for upgrading your GC or HPLC. Throw away paper recorders, integrators, and DOS-based systems, and work with the latest generation of computing technology. Automatic or manual operation is possible (depending on you chromatograph configuration). Autosamplers and fraction collectors can be triggered with contact closure or TTL signals. Multi-run experiments are controlled via sequence documents (PowerChrom system). All information (methods, calibrations, peak reports, as well as raw data) is stored in the one convenient data file, which can contain up to 999 runs! You can export raw chromatograms (as graphics or tabular data), peak reports, and method and sequence tables, to other graphing software, word processors, and spreadsheets. For difficult peaks, when adjusting automatic thresholds becomes time consuming, just use manual peak editing to add, delete, skim or otherwise directly edit a peak - just point and click! Calibration curves can be fitted with linear, quadratic or even point-to-point (linear interpolation) response functions. Sequence documents can be used to automate a series of runs when used with a suitable autosampler. (PowerChrom 280 system). PowerChrom oversamples the signal then averages the readings for each data point gathered, giving enhanced signal-to-noise ratios. Also, at recording speeds of 40 /s or less, the signal is averaged over whole mains cycles (50 or 60 Hz mains power), which eliminates the effects of mains hum. Thus you always get the highest quality data possible from your detectors.